A groundbreaking study in Tanzania has revealed figures quantifying the impact decades of climate change has had on coffee production with increasing night time temperatures shown to be the biggest climatic cause of diminishing coffee yields. While scientists had long predicted that global production of the Coffea arabica species would suffer from climate change, this study is the first to reveal figures showing that climate change is already affecting C. arabica production with future projections of severe reductions in productivity if adequate agricultural adaption strategies are not put in place. To assess the impact of climate change on C. arabica production in Tanzania, researchers from IITA, the University of the Witwatersrand, South Africa, Uganda, and the International Center for Tropical Agriculture (CIAT), Colombia analyzed a series of production and climate data for the main C. arabica growing regions in the northern and southern highlands of Tanzania for the years between 1961 and 2012. Monthly temperature and daily rainfall figures for the most important phases in the development of the coffee plant were analyzed to figure out which climatic factors had the greatest impact on coffee production. The researchers also sought to identify the key points in the development of the coffee plant where the impact of a climatic factor determines yield and productivity. Findings from the study published in the Journal of Agricultural and Forest Meteorology show that increasing night-time (minimum) temperature was the most significant climatic factor determining coffee yield and production. Although increasing trends in average temperature were observed between 1960 and 2010, it was primarily driven by substantial increases in daily minimum temperatures of +0.31 oC/decade. Every 1 oC increase in minimum temperature resulted in a yield loss of 137 ± 16.87 kg/ha. Rainfall on the other hand, only affected yields when there were more rainy days during the flowering season of the coffee plant leading to losses of just 1.58 kg/ha. The observed impact of rain coupled with pronounced increases in minimum temperatures recorded during flowering (+0.35 oC/decade) and ripening (+0.30 oC/decade) indicate that yields are most strongly influenced by responses to climatic actions during the growing and flowering seasons. If these trends continue without proactive adaptation strategies for coffee production, yields are projected to plummet even further as temperatures rise. The model forecast indicates average coffee yields will drop to 244 ± 41 kg/ha and 145 kg/ha by 2030 and 2060, respectively. A more realistic but scarier proposition projected by a non-linear regression model is the likelihood of yields dropping to 100 kg/ha and below if as is likely, minimum temperatures approach 18oC by 2060. Given that coffee production supports the livelihoods of more than 2.4 million individuals in Tanzania, and up to 25 million families worldwide, these forecasts have major livelihood implications, especially for other C. arabica growing countries where minimum temperature trends have followed remarkably similar patterns (e.g., Brazil, Colombia, Costa Rica, Ethiopia, and Kenya). 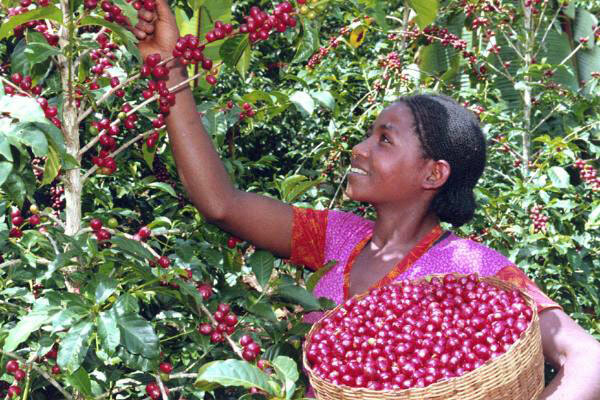 There is an urgent need therefore for stakeholders and decision makers in the public and private sectors to invest in climate change adaptation strategies that will ensure the sustainability of coffee production and guarantee the livelihoods of millions of smallholder farmers who depend on it.